I’ve purchased the book Gallup StrengthsFinder 2.0 and participated in the StrengthsFinder online assessment. The resulting report really provided me with helpful insights for my professional- and personal development. I was tipped about the StrengthsFinder 2.0 assessment by Julie Brown, Talent Development Manager at Microsoft. The Gallup StrengthsFinder 2.0 book starts with an introduction about finding your own strengths. Tom Rath argues that this statement is a misguided maxim. It would result in the fact that someone would devote more time on his/her shortcomings than on his/her strengths, or help to become who we are not. Tom Rath furthermore states that most organizational hierarchies force employees into a very different role, instead of allowing for an entire career of progression within a specific role that fits someones talents. Gallup’s research has shown that most successful people start with a dominant talent, and then add skills knowledge and practice to the mix. Unfortunately a lot of professionals struggle to describe their natural talents, while this raw dominant talent serves as a mathematical multiplier, driving your strength and development. 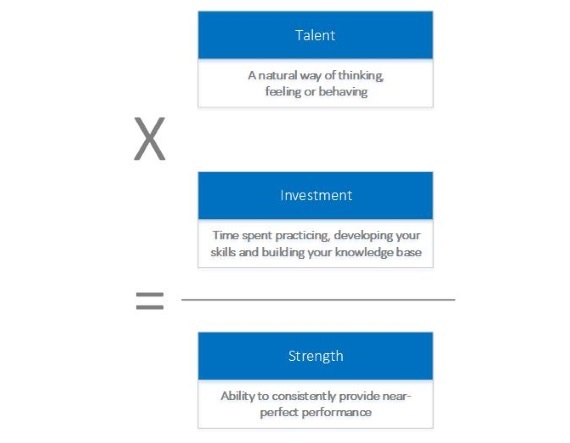 In a simple mathematical formula: Strength = Talent * Investment. While it is good to be aware of your talents and strength, it is also good to be aware of your limitations. Dominant talents result in blind spots, or you might have certain weaknesses. Main questions here is if it’s necessary for you to operate in an area of lesser talent. If that’s the case you might want to partner with someone who has more talent in that specific area. The ideas for action discussed in the StrengthsFinder 2.0 book, also cover 10 ideas that help you look out for your blind spots. Frequently discussing your talents, strengths with colleagues and coworkers. It will help you to focus your investment and thus building strength in an effective way. I did sent the report to a few of my best friends and asked them to provide feedback on this things they recognized (or not). Furthermore I used the Strengthfinder 2.0 assessment results to compare with my talents from the “talentenspel” (developed by Willem Glaudemans), a different talent based training. These are my top 5 strengths according to the StrengthFinder 2.0 Online Assessment. Most of the book contents covers context, tools and ideas to further develop your strength. The Gallup StrengthsFinder book continuous with an overview of all available 34 strengths (themes) and ideas for action. I can highly recommend the Gallup StrengthsFinder 2.0 online assessment, because it has provided me with great insights for my personal- and professional development. The Strengthfinder 2.0 asseessment results confirmed my talents from the “talentenspel” which is developed by Willem Glaudemans. The is a game like experience that helps you identify your 12 talents and the way those collaborate or hinder each other. While the talentenspel is more aimed at self awareness and identifying your talents. The Gallup StrengthsFinder book comes with a more actionable approach to improve strength based on your talents. The StrengthFinder report provides context, methodology but most important ideas for action. I’ve found a lot of value in this ideas for action for each strength as well as the business scenario’s. 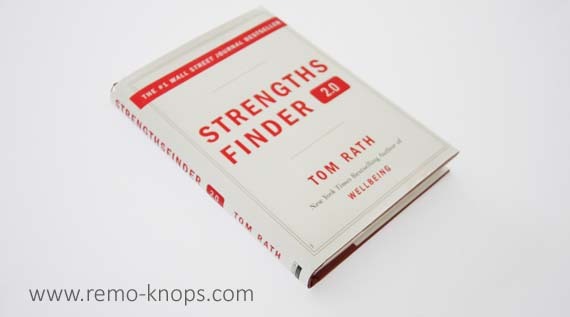 Some close friends read the StrengthFinder 2.0 and confirmed or argued the different aspects of my top 5 strengths. I tried to include strategies and some ideas for action in my personal development plan. Overall it really helped me to define the direction for my professional next step. A little while I wrote an article about Peter F. Drucker famous book Managing Oneself. I think it is a nice complement to the Gallup StrengthsFinder 2.0 book review. Hey!, I found this information for you: "Gallup StrengthsFinder 2.0 – Book review". Here is the website link: https://www.remo-knops.com/3339/gallup-strengthsfinder-2-0-book-review/. Thank you.